After several years of reign of terror and evading arrest, police operatives have finally arrested one Abdulrazak Kareem popularly known as Falapa, over alleged killings, gang war and destruction of properties on Lagos Island. Falapa was was trailed and arrested by police operatives from Adeniyi Adele Division and had been transfered to the State Command, Ikeja, Lagos. Police sources said that the guy, who was alleged to be the leader of the Okepopo boys was arrested on Friday after being declared wanted for his alleged criminal activities on the Island and its environs in the state. PM Express also gathered that the suspect had been involved in cult wars and caused serious violence that had claimed many lives in the past. It would be recalled that in September 2017, a gang war broke out between the Okepopo boys and the Onola boys which residents attributed to supremacy tussle in the community. 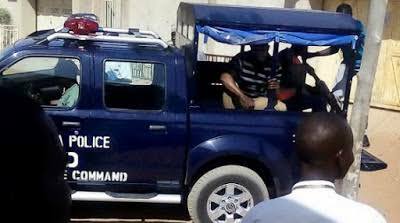 The supremacy war which lasted for more than a week allegedly led to the murder of six persons from both gangs while properties worth millions of Naira were said to have been destroyed. A source under anonymity confirmed the arrested of Falapa to PM Express saying: “Yes Falapa was arrested! Police officers from Adeniji Adele Police Division arrested him on Friday”.